Apple’s media event is scheduled for October the 4th and the rumor mill hasn’t stopped churning out new information. 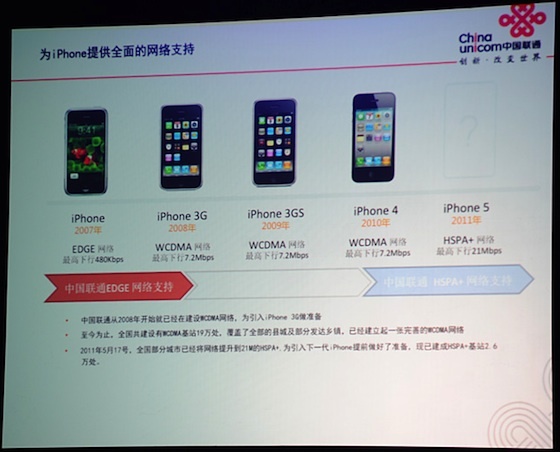 At the Macworld Asia 2011 Conference China Unicom while outlining the wireless technologies adopted in Apple’s iPhone mentioned that the upcoming iPhone 5 will be getting HSPA+ support. Currently the iPhone 4 can only reach 7.2MBPS of theoretical speed through WCDMA but if this particular bit of rumor is true the iPhone 5 will get a bump upto 21MBPS thanks to HSPA+. The chances of Apple’s upcoming iPhone being limited by WCDMA is unlikely considering Apple has alot to live up to with its next iPhone and the competition (android) is already churning out 4G LTE smartphones by the day. The real question is which technology can we expect in the next gen iPhone, wether it will be HSPA+, 4G Wimax or LTE. The best option from our point of view would obviously be 4G LTE since its the fastest thing out there and is being incorporated in the US atleast very quickly. But if the rumor is true it might just be getting HSPA+ instead. We can’t say anything for now and nor do you have to wait a long time since the media event is only a week away and finally all the rumors can be separated from the actual facts. There is also a possibility that IF Apple launches two iPhones they might choose to incorporate different technologies in both, but right now this is just a VERY wild guess and we can’t say anything for sure until 4th of October.